[SatNews] Stratos Global has begun deployment of its new StratosMAX II broadband service across the Gulf of Mexico (GoM) region. The new StratosMAX II service provides last-mile radio connectivity accessing Stratos’ industry-leading digital microwave network. It connects customers back to shore through diverse shore crossings and onshore Stratos interconnection facilities. 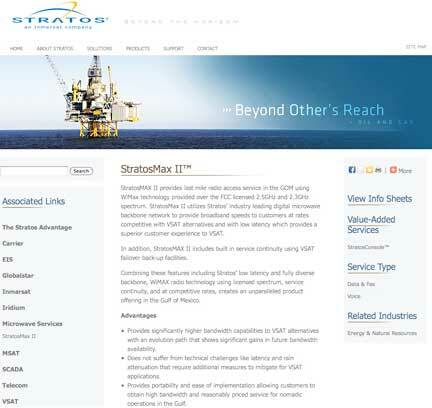 StratosMAX II now is providing reliable voice service, high-speed Internet connectivity, Stratos Hot Spot WiFi service and a wide range of mobile communications applications to oil rigs, platforms, offshore vessels and professionals managing the Gulf Oil Disaster containment and cleanup efforts. 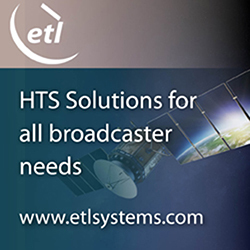 The IP-based StratosMAX II service is consistent with the high-bandwidth, low-latency features of Stratos’ microwave services and it is competitively priced against VSAT and legacy radio technologies. StratosMAX II is based on WiMAX (Worldwide Interoperability for Microwave Access) standards. WiMAX technology is provisioned by Stratos over licensed spectrum across the GoM. Data rates with StratosMAX II are comparable to land-based DSL and cable-modem service.